When I’m talking to friends or clients they often say to me how they’d like to do more exercise, but they just can’t find the time. First off, it’s of course important to say that it’s recommended that we all take part in 2 and a half hours of aerobic activity (or one and a quarter hours of intense activity, every week, as well as exercise that strengthens your muscles at least twice a week. But that said, I’m a firm believer in doing something rather than nothing. And that once you start doing some exercise, it becomes a lot easier to do more, partly because you’re fitter, and partly because the mental blocks start to drop away. So here’s my top 10 ideas to help you get more active. 1. Don’t make it bigger than it has to be. Not got time for a 40 minute run? Fine, then just go for 20 minutes! That’s better than nothing. Yes, aim for the recommended levels of exercise, but don’t let not having time for the full thing stop you doing anything. 2. Don’t go it alone. It’s often much easier to motivate yourself if you’re doing exercise with others, if only because if you’ve said you’ll meet someone to do it, then you’re less likely to drop out at the last moment. So whether it’s running, rowing, football, circus skills, or whatever you’re into/want to try, either find a friend who’d like to give it a go as well, or see if you can find a local club. Most will let you try a session before you pay. 3. Could you spare 3 minutes? I reckon pretty much everyone can find 3 minutes to spare each day. Whether it’s before you go to work, waiting for the kettle to boil or watching telly. Set yourself a rolling programme of a few key exercises that will develop your arms, your legs and your core (tummy) muscles, maybe plank, press ups, squats or lunges. And do a few from the set each day. Even if you miss a few days you’ll soon start to feel the difference. You could even write down how many you do of each before you need to take a rest – seeing how you improve is a great motivator. And the strength you build up will help you with other exercise, as well as everyday life. 4. 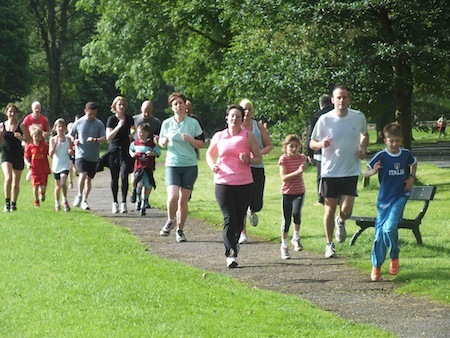 Park run – ok, running’s not for everyone, but it is a really accessible and cheap way to get fit. All you need* is a bit of motivation, and one of the best ways to find that is organised runs. Park Runs are completely free, timed 5k runs that take place in parks across the country (and now internationally) every Saturday morning. There’s a complete mix of people taking part, so if you don’t think you can run 5k, no worries, run a bit, walk when you need to and then run again. Getting your time emailed through means you can see how you improve over time, and can make it strangely addictive. (* If you are running on any sort of regular basis, I’d also recommend getting a decent pair of trainers fitted to your way of running (gait) to prevent injuries). 5. Use your tooth brushing time! I’ve started doing 1 leg squats whilst I brush my teeth, you could do anything that doesn’t involve both arms or too much balance, and there you go, you’ve just added another few minutes to your 3 minute strength work out (above), without losing any time from your day. And I actually find it’s improved my tooth brushing because now I’m not rushing through brushing my teeth! 6. Fartlek – not only one of my favourite words in fitness, but also a great way to get more bang for your buck! It means “speed play” in Swedish, and essentially means an unstructured work out mixing up the speed and the intensity. So mix up your run with some short sharp bursts, followed by longer recovery jogs, interspersed with some longer bouts of a sustained, faster pace or some hill reps. Not only will it be more interesting, but you’ll get more training benefits, meaning that a shorter run could be just as valuable as a longer one (it can apply to any aerobic exercise, not just running). As with any exercise, make sure you warm up and cool down, and don’t push yourself more than feels comfortable. 7. Take advantage of the summer for a dip in the sun – When was the last time you went swimming? Many people still associate swimming with school outings characterised by dirty changing rooms and plasters floating in the water. But there’s a massive growth in outdoor swimming – whether in one of the many Lidos or lakes and reservoirs that are popping up, or take the full plunge and go wild swimming. Whilst the sun’s still shining you should be fine without a wetsuit and there’s no better way to cool off and get some exercise. 8. On yer bike – its certainly not for everyone but I can’t imagine life without my trusty steed. Generally it’s the quickest and cheapest way to get to work and around London where I live. Many are understandably nervous about cycling in a city but there’s lots of free resources to help. Check out maps developed to show you the best (or quietest, fastest etc) cycling route and most London boroughs offer free training to get you used to cycling in traffic. Worried about getting to work sweaty? Well cycle slower! And take a change of clothes with you. Unless you’re practicing your Tour de France pace you probably won’t need a shower. 9. Sit around in front of your computer (but only until you’ve found the right app!). There’s hundreds of apps out there to keep you on track. Some like Mapmyrun or mapmyride let you track the route and work out your stats, others like Strava have leader boards where you can compare your times for runs, cycling etc against yourself or others. And there’s all the couch to 5k or build to 20 press ups apps. Have a look round a see what works for you. 10. Over to you, what’s your best tip? Post below. Or if you’ve got any questions, let me know. Disclaimer: sorry for slight London bias in some of the links! This entry was posted in health, Triathlon, weight loss and tagged cardiovascular, CV, feel fit, fitness, get fit, health, lose weight, weight loss. Bookmark the permalink.